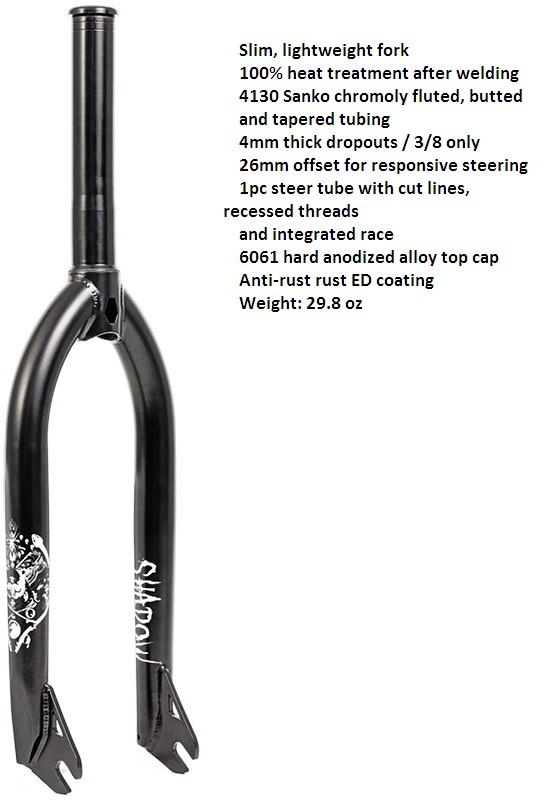 SHADOW CREEPER FORK The Shadow Conspiracy Creeper BMX Forks feature a refined design for lighter weight. Integrated Bearing Race; 5mm thick dropouts / 3/8 6061 alloy lightweight top cap Limited lifetime warranty Weight: 907.0 g Material: Chromoly Brake Type: None S.H.I.S. 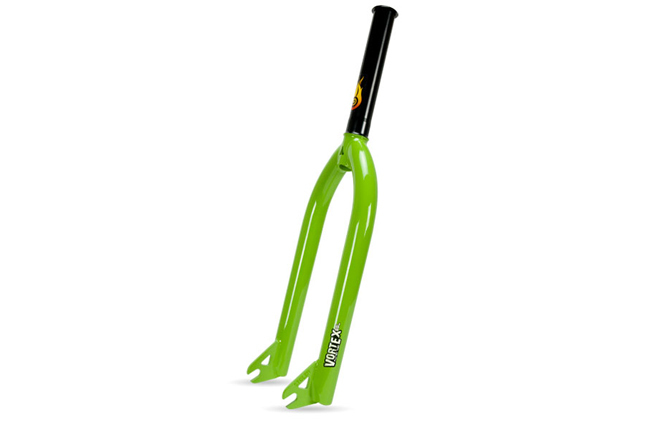 Clamp Diameter: 28.6 Steerer Tube: 1-1/8" Threadless Steerer Tube Length: 165.0 mm Wheel Size: 20" Front Axle Type: 3/8"
STOLEN TYPHOON FORK GREEN Features: 31.8mm to 25.8mm tapered legs with internal butting (1.4/1.1/0.8mm) and a forged end notch for peg clearance. 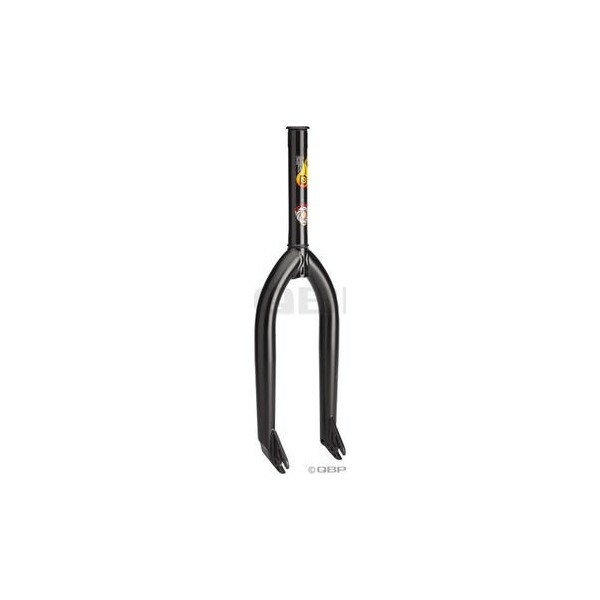 1-piece rust proof spiral fluting Chromoly steerer tube with integrated crown race. Sand cast dropouts for 3/8" axles are 5mm thick dropout with 1.5mm deep reliefs. P2 post-production heat-treated. Black Vortex top cap included. Steerer length: 165mm Offset: 34.5mm Colors: Black, Matte Blue, Gang Green, Neon Orange, Matte Red, or White Weight: 31.8 oz. 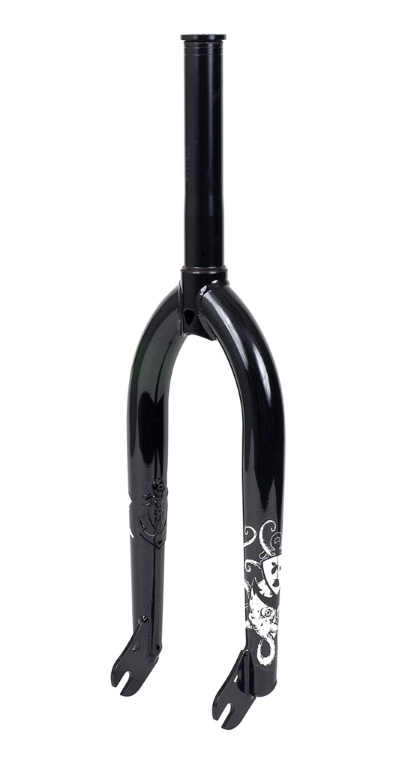 STOLEN TYPHOON FORK BLACK Features: 31.8mm to 25.8mm tapered legs with internal butting (1.4/1.1/0.8mm) and a forged end notch for peg clearance. 1-piece rust proof spiral fluting Chromoly steerer tube with integrated crown race. Sand cast dropouts for 3/8" axles are 5mm thick dropout with 1.5mm deep reliefs. P2 post-production heat-treated. Black Vortex top cap included. 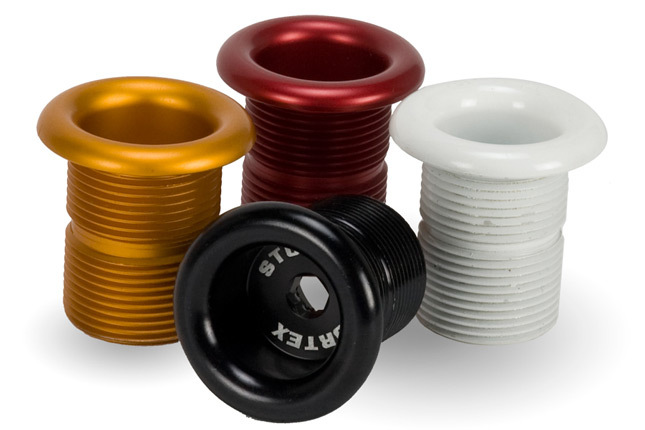 Steerer length: 165mm Offset: 34.5mm Colors: Black, Matte Blue, Gang Green, Neon Orange, Matte Red, or White Weight: 31.8 oz. 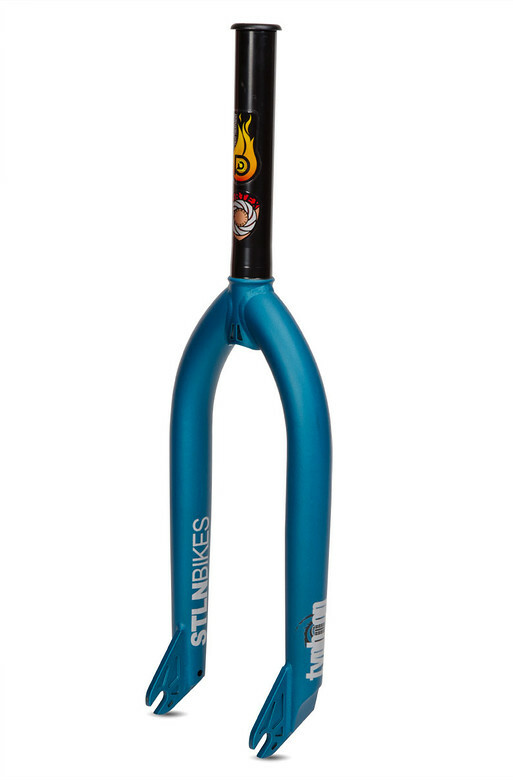 STOLEN TYPHOON FORK BLUE Features: 31.8mm to 25.8mm tapered legs with internal butting (1.4/1.1/0.8mm) and a forged end notch for peg clearance. 1-piece rust proof spiral fluting Chromoly steerer tube with integrated crown race. Sand cast dropouts for 3/8" axles are 5mm thick dropout with 1.5mm deep reliefs. P2 post-production heat-treated. Black Vortex top cap included. Steerer length: 165mm Offset: 34.5mm Colors: Black, Matte Blue, Gang Green, Neon Orange, Matte Red, or White Weight: 31.8 oz. 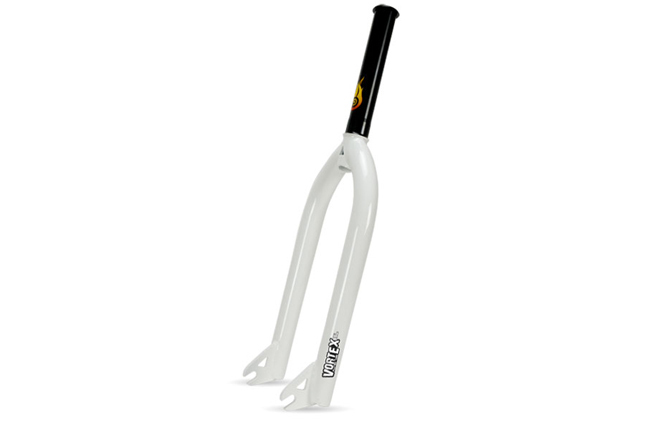 STOLEN TYPHOON FORK WHITE Features: 31.8mm to 25.8mm tapered legs with internal butting (1.4/1.1/0.8mm) and a forged end notch for peg clearance. 1-piece rust proof spiral fluting Chromoly steerer tube with integrated crown race. Sand cast dropouts for 3/8" axles are 5mm thick dropout with 1.5mm deep reliefs. P2 post-production heat-treated. Black Vortex top cap included. Steerer length: 165mm Offset: 34.5mm Colors: Black, Matte Blue, Gang Green, Neon Orange, Matte Red, or White Weight: 31.8 oz. 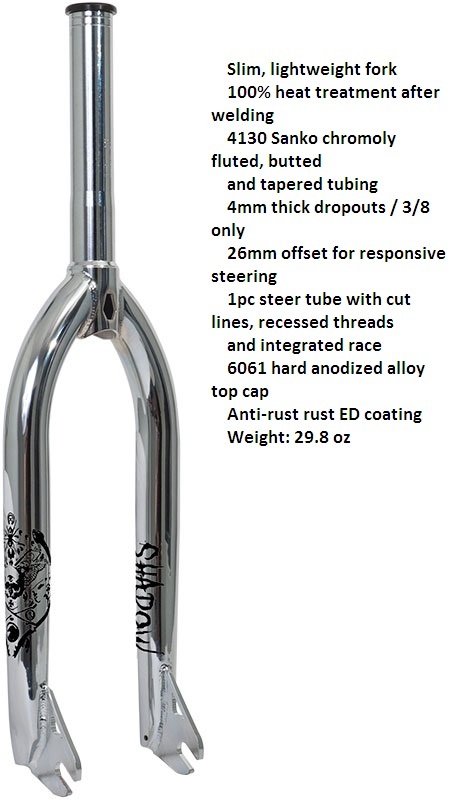 STOLEN VORTEX FORK WHITE Features: Fluted 28.6mm Chromoly legs, one-piece rust proofed fluted Chromoly steerer tube w/ integrated crown race, 5mm dropouts for 3/8” axles. P2 post-production heat treated. Vortex top cap included. Steerer length: 165mm Offset: 33.1mm Colors: Black, Gang Green, Neon Orange, or White Weight: 29.9oz. STOLEN VORTEX FORK ORANGE Features: Fluted 28.6mm Chromoly legs, one-piece rust proofed fluted Chromoly steerer tube w/ integrated crown race, 5mm dropouts for 3/8” axles. P2 post-production heat treated. Vortex top cap included. 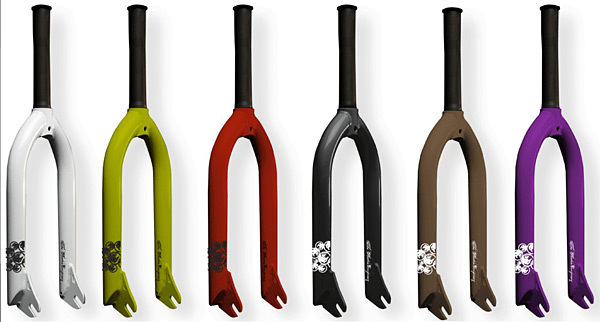 Steerer length: 165mm Offset: 33.1mm Colors: Black, Gang Green, Neon Orange, or White Weight: 29.9oz. STOLEN VORTEX FORK GREEN Features: Fluted 28.6mm Chromoly legs, one-piece rust proofed fluted Chromoly steerer tube w/ integrated crown race, 5mm dropouts for 3/8” axles. P2 post-production heat treated. Vortex top cap included. 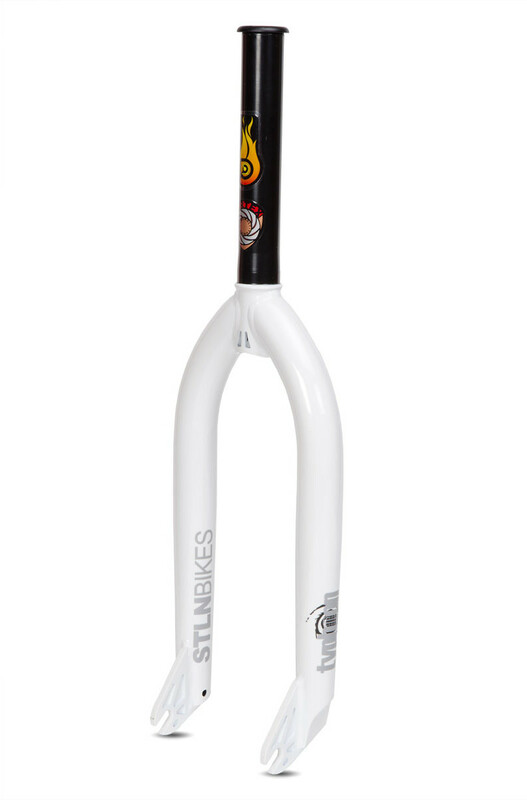 Steerer length: 165mm Offset: 33.1mm Colors: Black, Gang Green, Neon Orange, or White Weight: 29.9oz. 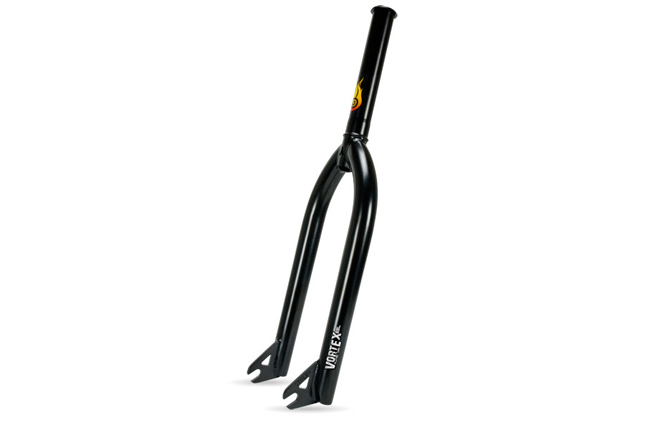 STOLEN VORTEX FORK BLACK Features: Fluted 28.6mm Chromoly legs, one-piece rust proofed fluted Chromoly steerer tube w/ integrated crown race, 5mm dropouts for 3/8” axles. P2 post-production heat treated. Vortex top cap included. Steerer length: 165mm Offset: 33.1mm Colors: Black, Gang Green, Neon Orange, or White Weight: 29.9oz. 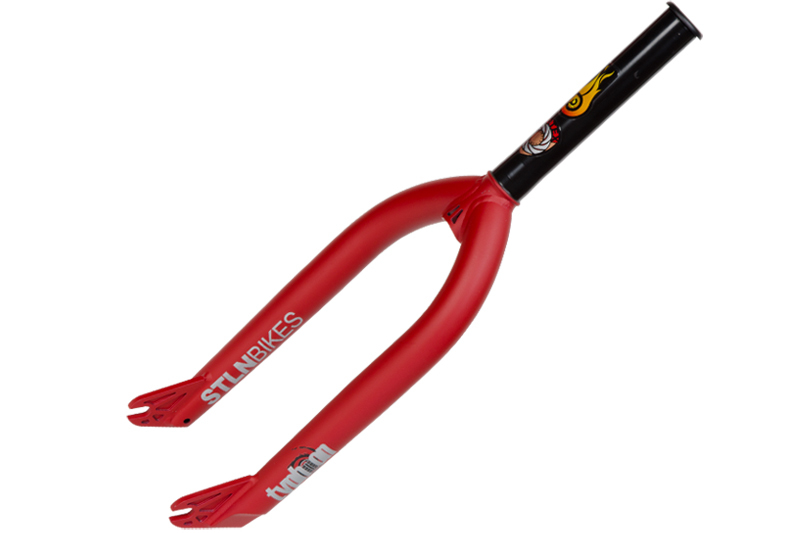 STOLEN TYPHOON FORK RED Features: 31.8mm to 25.8mm tapered legs with internal butting (1.4/1.1/0.8mm) and a forged end notch for peg clearance. 1-piece rust proof spiral fluting Chromoly steerer tube with integrated crown race. Sand cast dropouts for 3/8" axles are 5mm thick dropout with 1.5mm deep reliefs. P2 post-production heat-treated. 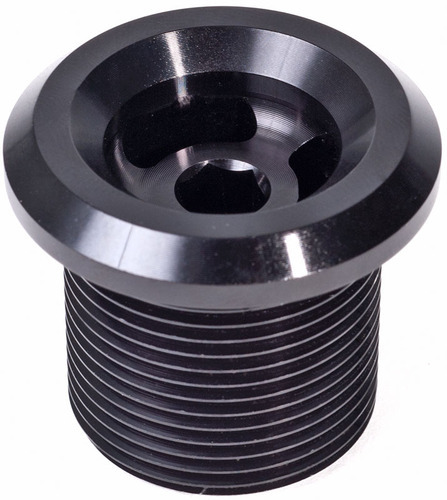 Black Vortex top cap included. Steerer length: 165mm Offset: 34.5mm Colors: Black, Matte Blue, Gang Green, Neon Orange, Matte Red, or White Weight: 31.8 oz.